Response IT at your service... nothing to hide always upfront, we treat our customers networks as if they belonged to us. No long term contracts to tie you in, experienced engineers who can speak plain English, Excellent value for the services offered, always re-sell the best software and hardware on the market. Do you have a PC network, but need to connect a MAC to the server? Did you know that MAC’s can join domains? Let us get your MACs working correctly for the first time on your PC network. Do you stay up at night wondering if your systems are backed up correctly? Let us review your systems and see if we can help you sleep easy. When was the last time you had a systems strategic review? Do you have an IT plan? Need to register a domain name quickly for a new business? Want to know the cheapest and best way to host a new domain? Sick of spam? Always having problems sending emails to certain addresses? Try the industry leading mail filtering software from Microsoft for just £2 per user per month. Never sure if you are buying the best equipment? Paying more than you should because you dont know the cheapest suppliers? We will make sure you get the best kit at the right price. 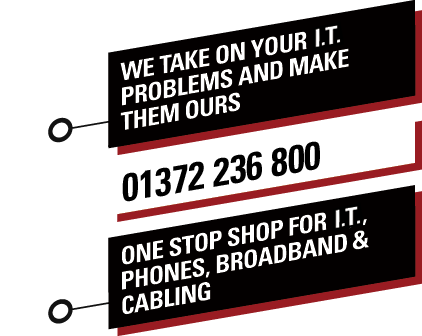 Tired of waiting hours on the phone for your broadband technical support? Try the UK’s leading ISP for business, Zen Internet. Need an extra pair of hands while you get on with something more important? We can supply the extra staff you need for holiday cover or that new desktop rollout. Need mobile email? Blackberries, Windows Mobile, Nokia Intellisync - we can manage and setup any systems you want. Server, PC’s, Routers, Switches - it’s our bread and butter. This is our core business and our area of expertise. Concerned your office move is going to affect your business? Let us worry about getting your phones and IT equipment in place. Got a complex project thats getting out of hand? With years of IT management experience we can resolve any difficult technology related projects. Want to work from home? Want to work by the beach? We have the best and most secure home working solutions. Concerned about the risk of viruses? Heard about firewalls, but not sure if you have one? We can to a complete review of your sytem and install the latest wireless technology. Cables always getting in the way? Health and Safety picking you up when you get an audit done? We will get you tidied up. Want the latest system that allows you to pick up your phone and work from home? Is your current wireless system secure? We can review your current system and show you want can be done with the latest wireless technology. Are your current providers slow to respond? Do you want friendly experienced engineers to fix your problems quickly before downtime damages your business.